The F-35s are single engine planes. Asked what will happen if the engine fails, Peter MacKay replied, "It won't." We need planes for search and rescue. The F-35 is not appropriate for search and rescue. In July 2010, I wrote a column for my local paper, Island Tides, on the government's decision to buy 65 F-35 fighter jets. Now that the Auditor General has confirmed what everyone knew -- that the planes were wildly over budget and that we were being misled (lied to?) at every turn -- I decided to go back and look at my column. "Like many military contracts in the US, the costs of the F-35 have spiralled and are way over budget. In March 2010, U.S. Defence Secretary Robert Gates told the Congress that it was 'unacceptable' that the F-35 is 50 per cent over-budget. Costs of developing the new fighter jets is approaching $300 billion. With bureaucratic baffle-gab that takes your breath away, the Pentagon critique of the fighter jet programme concluded: 'affordability is no longer embraced as a core pillar.'" "Peter MacKay is enthused about the jets. Lockheed Martin's F-35 jets are exciting new toys. They are so exciting that our government did not hold an open contracting process. We only wanted these planes. They can take off and land on aircraft carriers. They have stealth coating. They can engage in air-to-air combat and rely on mid-air re-fueling...We don't have aircraft carriers. We have no plausible security scenario in which air-to-air combat is anticipated. (The Battle of Britain was a long time ago.) And stealth coating? Are we planning a surprise invasion? 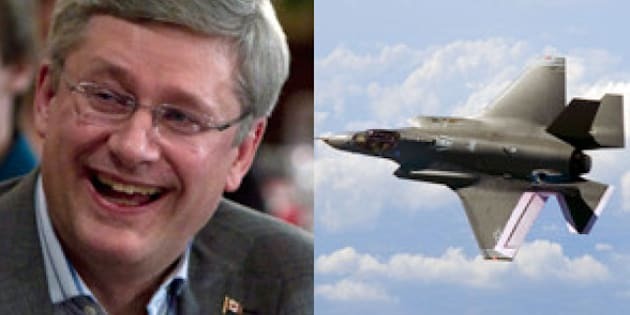 True, our aging CF-18s need to be replaced. Our large geography has always led to a priority choice for two-engine planes, so if a plane is in a remote spot and loses an engine, the pilot can get to a safe place to land. The F-35s are single engine planes. Asked what will happen if the engine fails, Peter MacKay replied 'it won't.' We need planes for search and rescue. The F-35 is not appropriate for search and rescue." So, it seems Canada is spending money we don't have for planes we don't need. And it seems we are doing this to hold our place in some macho military solidarity with the Pentagon. The opportunity costs of $16 billion for fighter jets is enormous -- in lost opportunities to reduce poverty, create jobs, protect health care and fight climate change. None of this has been debated or discussed in the House. And it was not in the 2010 budget. I will work with other parties to reverse this sale and direct priorities to those Canadians value. So, I was still using the Harper $16 billion estimate. But when the Parliamentary Budget Officer, Kevin Page, explained that those costs were off by about $10 billion or so in a March 2011 report, I believed him. Stephen Harper questioned him. The point is that not even willful blindness of the most acute variety can be pleaded by the prime minister in his attack on Page. If I knew the planes were being chosen without criteria or a proper open bidding process, that the whole project was a boondoggle and that Canada was going to be spending $25 billion on planes we did not need, so too did everyone else. The auditor general's report should be required reading for every voter who thought Stephen Harper had the qualities of a wise manager of the public purse.